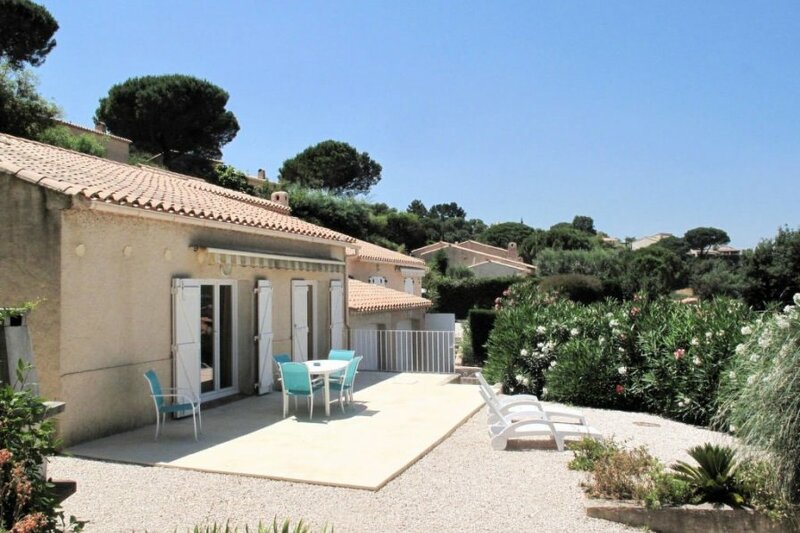 This 2 bedroom apartment with swimming pool is located in Sainte-Maxime and sleeps 5 people. It has air conditioning and garage. The apartment is near a beach. House attached to another house, 4 - 5 people, 3 room/s, 2 bedroom/s, 1 bathroom/s, approximately 80 m², 2 floor/s. Equipment: satellite TV; stereo; washing machine, iron/ironing board; air conditioning (only in the bedrooms); electric heating. Electricity according to consumption approximately € 0.18/​kWh. Holiday resort tax. Linen/towels must be brought along. Deposit € 350 (in cash). Cot/​High chair free of charge (on order). Pet 1 pet allowed (please advise prior to arrival; additional animals on request only). Pool (shared use): 19.0 x 9.0 m, 13/04/19-28/09/19, depending on the weather, children's pool. Pool area: tiled, external shower. Please note: distance to the pool approximately 500 m.
Plot description: private part of the estate approximately 600 m², partially surrounded (fence, wall), gravel. Terrace 30 m² (sun-blind), furnishing provided, brick barbecue. The agent describes this apartment as a family friendly holiday rental ideal for the summer holidays. It is also good value for money. This apartment is located in Sainte-Maxime. The nearest airport is 55km away. It is set in a convenient location, just 0 metres away from a beach and 4km away from the city center. The apartment is well equipped: it has air conditioning, a dishwasher and a washing machine. It also has a BBQ and a tennis court.